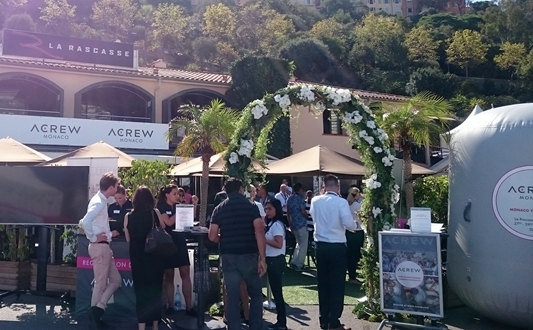 Last week, the team at Pinpoint Works spent three days during the Monaco Yacht Show at La Rascasse with ACREW Yachting giving demos, meeting with existing users and signing up new clients to the Pinpoint Works program. One of dozens of collaborators, they had a prime spot on the brasserie terrace taking full advantage of the foot traffic brought in by a full schedule of events by ACREW for captains, crew, and other industry professionals. Stockdale is a superyacht captain who developed the Pinpoint Works system during frustration of managing warranty and on-going work lists during an 80m new build. “Excel and Access just weren’t getting the job done, so I wanted to try and create a solution not just for myself but for the yachting community,” Stockdale noted. The platform is cloud-based and operates on web and mobile apps (Android and iOS), with the mobile apps fully functional offline. Each site is unique as it uses the yacht’s GA (general arrangement) to create an interactive worklist which can then be shared with other users. Users can add various levels of status and priority to points, create custom fields and tags to tailor the program specifically to each project. Their newest feature was released during MYS and incorporates the ability to add 360° photos to points. This was a recommendation by several users, including interior designers, build teams, and project managers at the build and refit stages of a project, allowing them to document the ongoing construction of the interior fit-out. Pinpoint Works has more features in the pipeline including an iPad and tablet app to be released in the coming weeks. The Pinpoint Works team will also be participating for the second year in the Marine Exhibition Trade Show (METS) in Amsterdam in November with their technical partner, Wrede Consulting. “It’s a really exciting time for the company. With over 60 subscribed yachts and companies ranging from 20m sail yachts to 150m+ motor yachts in build, our list of users is quickly growing,” added Leslie Gillotte, sales and marketing director for Pinpoint Works. Pinpoint Works offers online demos and 30-day free trials. Contact Leslie to find out more or make an appointment for METS: info@pinpointworks.com.